There are a few thousand people around the world trying to reimagine computing to make it faster and more energy-efficient so we can continue to make the web an integral part of our lives. But unlike most of them, Jason Hoffman doesn’t work at a big Internet company like Google (S goog) or Facebook (s fb) and he didn’t start with a background in computer science. Hoffman came to the challenge by a different path: a quest to save his mother’s life. In 2005, Hoffman’s mother was diagnosed with breast cancer. His grandmother had died of the same disease . His mom thought it was a death sentence. Hoffman, then working as a doctor, reoriented his life to help her fight the disease. But instead of drawing on his medical training, he tapped his interest in computing — specifically the small hosting company he had started as a side project to help some of his friends build out new web services such as WordPress (see disclosure) or 37 Signals. For the first time since he was about 16, Hoffman was focused on one job — building Joyent — instead of two or three. That, and saving his marriage and his mom’s life. Despite long odds, his mom survived. His marriage didn’t. As for Joyent, once Hoffman turned his full attention to the company, he decided it had to be bigger than hosting a few blogs or helping a dozen entrepreneurs. “If this is what I’m going to do … It needs to be more of a change-the-world type of thing. 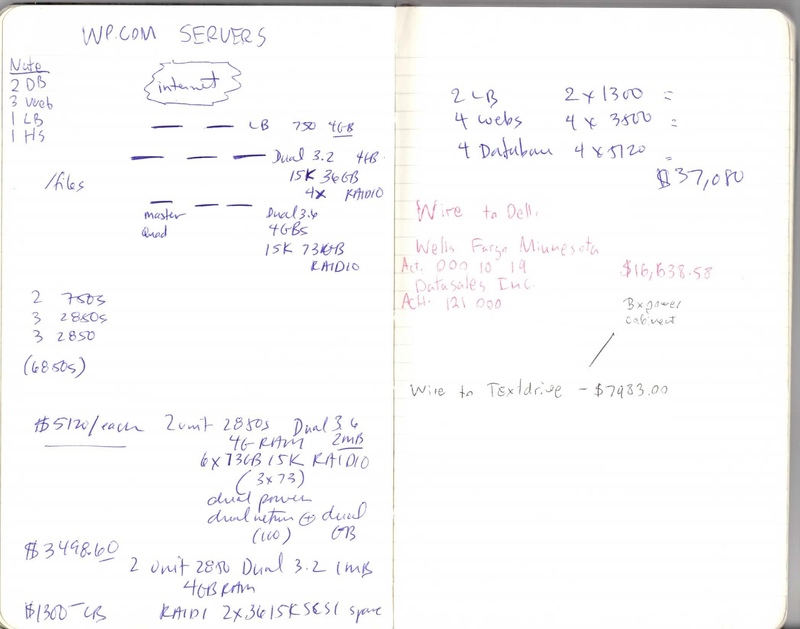 The plan became how could someone build a modern systems company and deliver it as a service?” Systems, as in giant clusters of servers that deliver all those games and crunch genomics data all at the same time. Our raging addiction to the Internet and the demand for computing everywhere we go is forcing a kind of reckoning in the IT space. Much like widespread automobile adoption forced a rethink of the transportation system, our dependence on the internet is forcing us to rethink the way we build computers. The next generation of cloud computing and data processing infrastructure will need to have flexible pools of storage available near powerful processors with a superfast and flexible network bridging the two. It’s massively distributed and looks more like a supercomputer than a rack of servers topped by a switch. Google knows it. Intel (S intc) knows it. VMware (s vmw) knows it. And before these companies knew it, Jason Hoffman knew it. Hoffman was born in Long Beach Calf., where his father brought the family after a tour in Vietnam. His father, a soldier, worked as an honor guard burying the dead coming back from the war, and his mother was a nurse. His family moved to Germany when he was six months old. And for the next decade, Hoffman started each year in a new school in a different place in the world, as an army brat. Despite his itinerant lifestyle, Hoffman did well in school, something he attributes to his voracious reading. During sixth grade, he read about two books a day and wrote them up as book reports, earning the ire of his classmates. Hoffman can still rankle others in the industry — in part because he is incredibly smart and not shy about sharing his opinions or rationalizations. Earlier this year, Joyent decided to shut down a service called TextDrive, despite having promised early TextDrive users that they would have lifetime accounts. Hoffman, a co-founder of TextDrive, which was then purchased by Joyent, took the vitriol of the angry users calmly, broadcasting snippets of the hate mail he received in a series of tweets. Hoffman later worked with TextDrive co-founder Dean Allen to address those concerns. It’s just with corporate strategy that he can be dispassionate. At one point during our interview, for example, he described his mom’s cancer diagnoses as “problematic.” Rather than talk about what she means to him or how he felt at the prospect of losing her, he went straight to how he solved the problem. Reading between the lines as Hoffman talks, he seems to feel that emotions can be an impediment because they can get in the way of clear-eyed solutions. He mentions, for example, the time he spent working in the ER during high school and college. Despite not wearing his emotions on his sleeve, Hoffman is a good friend to many in the industry. At home, he spends as many weekends as possible with his three daughters (one with his first wife and two with his second). On Hoffman’s birthday earlier this year, his wife and youngest daughter came to see him backstage at an industry conference bearing donuts, and despite the danger of a sticky suit before he was set to go on stage, he held his donut-eating daughter in his lap. Yet, even here he is supremely rational. Knowing that work and family are the two most important things in his life, he’s set up a system that supports both. He says he lives equidistant between his office and the airport so he can get home as quickly as possible from work or a trip. Hoffman’s beginnings in medicine primed him to rethink computing. From early in his career as a cancer researcher, Hofmann was playing with computers. 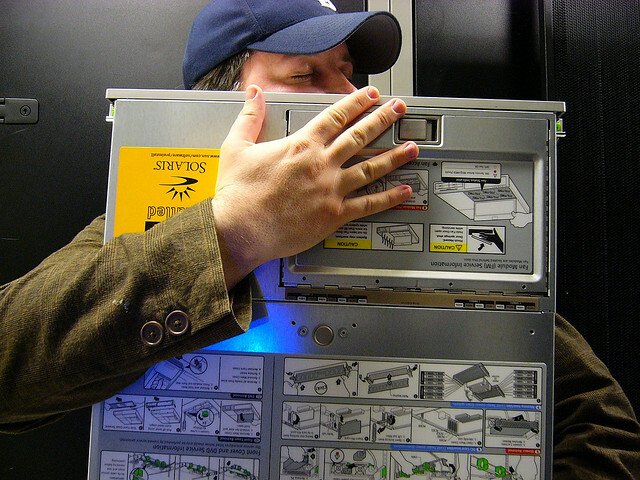 First it was giant SGI machines to help handle large data sets and images, but later it became Linux boxes and even mini supercomputers he built himself. Some of his initial research involved looking at people with cervical, breast and certain types of skin cancer and understanding genetic markers that predisposed them to these diseases. But the imagery and data sets taxed his machines. “The problem with computers is that they are built for doing math, but doing math is different than looking at images and moving bits and storing things, so I had general frustrations around storage,” Hoffman said. With Joyent, he saw the opportunity to fill that void– and provide exactly the type of computing we’re seeing with the rise of online video and picture-based services like Pinterest and big data. And he thought about ways to do it on the cheap to support those burgeoning online businesses. Hoffman’s drawings on how to scale out WordPress’ infrastructure. Joyent has raised $150 million, and landed dozens of mobile and ecommerce customers including ModCloth, GiltGroupe, LinkedIn, Digital Chocolate, Adobe and Voxer. Commercial success is good, but with a $150 million investment, the question for Hoffman is whether the company will go public or sell. On the technical side, Joyent’s goals are much clearer. Hoffman says he will soon be able to deliver an exabyte of storage — that’s the equivalent of 250 million high-def movies — with only 10 megawatts of power and $2 million. That’s a big brag, since the traditional thinking is that delivering an exabyte of storage would take around $200 million. For all its success, though, it’s still unclear whether Joyent will become the next big thing, or a Sun Microsystems– that is, home to brilliant technology that is unable to dominate the market. Joyent’s business of selling a private cloud based on a fundamentally different compute architecture means it uses a different operating system to deliver the best performance over a massively distributed system. Giant companies generally don’t want to adopt new OSes, and while Joyent offers hardware to service providers in on-premise boxes so customers can choose their provider, its other big problem is the competition. The company is basically trying to carve out a place as the infrastructure equivalent of an Aston Martin to Amazon’s Toyota. And it’s hard to fight against the commodity pricing that Amazon (s amzn) can offer. Hoffman sees this as his chance to make a mark on the compute world, and he’s pushing forward. And perhaps that’s his style — pursuit of a lofty intellectual goal and little tolerance for any drama that might slow the ship down. It looks like arrogance, but if he winds up developing tomorrow’s distributed compute architecture, no one will care.